You won’t find a casino, shopping atrium, photo studio, hair salon or multiple swimming pools, restaurants and lounges onboard the vessels of Blount Small Ship Adventures. You won’t be besieged by ship’s photographers at every turn and you won’t trip over thousands of fellow passengers because they’re not there. What you will find is an atmosphere akin to sailing aboard a friend’s yacht with a few – or in Blount’s case, fewer than 90 fellow passengers. Blount Small Ship Adventures, formerly called American Canadian Caribbean Line, is a family-owned company that was founded by the late shipbuilder Luther Blount. An innovator in ship design, his patented innovations and inventions continue to distinguish Blount’s 1997-built Grande Caribe and 1988-built Grande Mariner vessels. For instance, the retractable pilot house means the ships can cruise narrow waterways and under low bridges. In some ports, the ships’ uniquely designed bow ramp makes it possible to walk directly from ship to shore. That avoids boarding a smaller tender vessel. The stern also boasts swimming platform. Today the company is operated by Blount’s three daughters, including Nancy Blount, whom you may run into aboard. Ships are American-flagged and American-crewed shallow-draft coastal cruise vessels. These include southern coastal cruises and Mississippi River voyages. 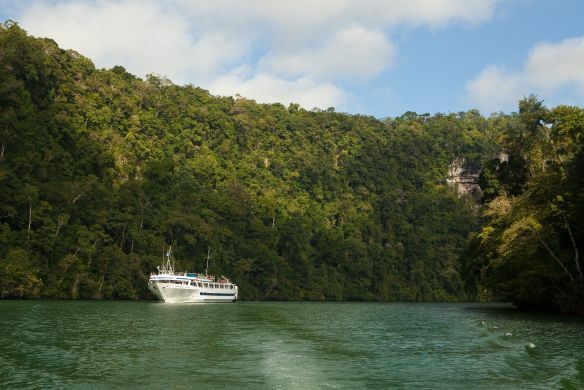 The cruises tend to attract a seasoned, mature and fairly well-heeled traveler; the talk over meals is of past trips to Antarctica, Nairobi and other far-flung destinations. Many of the passengers return for a fourth, 16th or 25th Blount adventure, citing Blount’s personalized service as the carrot that keeps bringing them back. “The service is very good, and the crew are people who enjoy life and enjoy travels,” says Barbara Pierce Bird, a retired interior designer from Framingham, MA. She has taken four voyages with Blount. Both ships serve up all-American fare -- generally reflecting the itinerary’s region -- for hearty, family-style meals. Each day the menu is posted on the dining room's chalk board. Guests are called to each meal with the ringing of a bell -- the kind that conjurs up memories of ones used in the past to call schoolchildren indoors. In the dining room, guests chow down on tender and juicy pork medallions, fresh lobster, melt-in-your-mouth steak tips or perhaps salmon with lemon butter. Side dishes might include fresh green beans strewn with roasted red peppers, herbed couscous, freshly baked bread. Desserts might include chocolate-coconut bread pudding, lemon cream pie or petite strawberry shortcake. And that’s just dinner. Breakfast and lunch are equally tasty and ambitious. Portions are robust and the platters and serving dishes arrive steaming at the table. New this year? 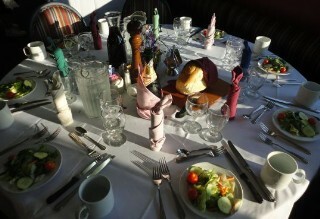 At lunch and dinner, carafes of red and white wine are placed on tables for guests to enjoy. Beer is available upon request. It's a new, complimentary amenity. 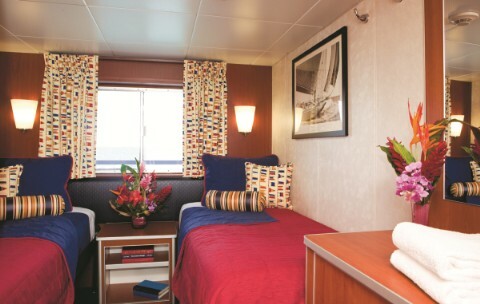 Cabins are located on all three decks and include both outside and inside staterooms, which open to the deck or the interior corridor, and in some cases, both. Although small, each cabin has a private shower, sink and toilet. Recently, the line upgraded most bathrooms with self-contained, enclosed showers. Could be improved? Beds are rather narrow. Mattresses also could be thicker and plusher – a noticeable deficit, particularly for those taking a longer voyage. But this is a small ship cruise. 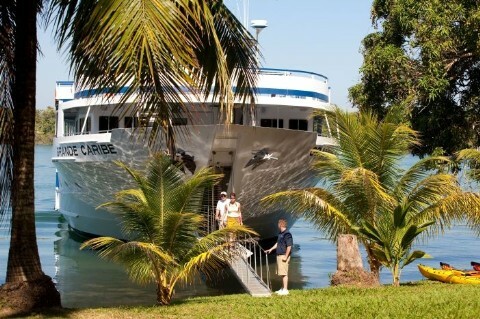 For some, the benefits of an intimate cruise with a maximum of 88 guests outweigh the cabin size and appointments. Passengers tend to get to know one another early on -- and they often leave as good friends. In large part that's due to a open seat dining concept; guests may dine with whom they choose, ofte changing things up from meal to meal. Cocktail hour gets rolling at about 5:30 p.m. in the Vista View Lounge (on the deck above the dining room). Guests also enjoy enrichment lectures, serve-yourself snacks or movies in this space, which offers 180-degree panoramic views. Alcohol isn’t sold onboard, but the line has a BYOB policy. Guests are free to stow their personal bottles, labeled with cabin number, in the lounge’s bar area. And, as mentioned earlier, guests enjoy complimentary wine and beer with lunch and dinner. The good news is that guests won't be astonished by an out-of-control or unexpected tab at trip’s end, which is sometimes the case on other lines. Don't expect big production shows or name entertainment onboard Blount. It's a simpler, more low-key and self-motivated type of onboard fun. Guests enjoy relaxing, reading, sunning or playing cards or games or working puzzle. Some cruisers might sketch or watch for birds of wildlife. For example, Bird indulges her talent for watercolors. From the ship's bow, she's painted scenes that have unfolded on voyages from West Palm Beach, FL, to New England. Guests also hear from expert lecturers who come onboard to talk about aspects of the itinerary. On a recent southern itinerary, a guest lecturer in Greenville, MS discussed the Mississippi River and the great floods of 1927. Cooking demonstrations might include a session to teach guests on a New Orleans voyage how to make Creole dishes. Wine tastings introduce budding oenophiles to the varietals of the Baltimore region. A kayak guide routinely travels with the ship and will announce dates and times for those who'd like to try this activity. In addition, the ship carries its own bicycles; a crew member will get the bikes ready for guests who wish to pedal around the port of their choosing. On some cruises, professional photography workshops offer instruction on various camera functions and how to capture excellent images in places that are, gratifyingly, the road less traveled. Optional shore tours are offered in each port. Those might include a carriage ride, trolley tour or visit to a major attraction. One plus? Small ship cruising is personalized and intimate. So it allows for last minute experiences that only a small ship can pull off – such as the mayor of a local town paying an onboard call or everyone on the ship getting an impromptu invitation to a cocktail reception in town that evening. Blount prides itself on personal service, an onboard atmosphere that feels like a family vacation and the ability to take guests to places only a small ship can go. 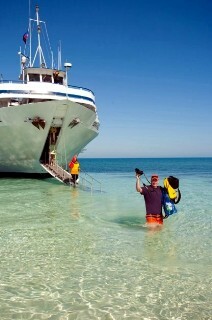 Visit www.BlountSmallShipAdventures.com to see a list of upcoming adventures, including a half dozen new itineraries offered for 2013. *Photos are owned, copyrighted and used courtesy of Blount Small Ship Adventures or Kathy Witt. All rights reserved. Please do not link to nor copy these photos. Thank you.